on SALE in sizes 78", 80" & 82"
DELUXE BAKER SHEET - NOW AVAILABLE! The BAKER BLANKET has been made in the U.S.A. since the late 1800's. 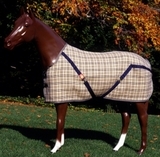 This is the stable blanket known worldwide for its traditional good looks and "tough as nails" durability. The acrylic fabric lasts for years and years with virtually no shrinkage or fading. Still "branded inside" for authenticity, this triple weave construction allows the fabric to breathe while at the same time preventing body heat from escaping. The BAKER SHEET is also made in the U.S.A., and is the matching sheet that accompanies the above blanket. Made from vat dyed acrylic yarn, satisfied horsemen report many years of satisfaction with this durable sheet. 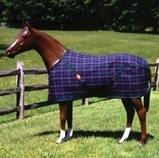 BAKER BLANKETS & BAKER SHEETS are stocked in sizes 60-86", but requests for smaller or larger sizes can be accommodated. Both are available in the Original Plaid (beige/black) or Tartan Plaid (hunter/navy/black/red), with contour cut styling for improved fit, bias surcingles, and 2 front straps. The Original Plaid comes with navy surcingles and fancy BAKER striped binding. The Tartan Plaid is trimmed in hunter and only available in sizes 78", 80" & 82". Custom trim colors, cut back neck, fleece withers, leg straps, and leather front straps are available for an additional charge.